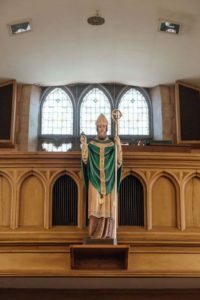 After 150 years of Saint Patrick Parish, you can expect that there is a vibrant history to share! So many different people, events, births, marriages, and celebrations have taken place at St. Patrick Catholic Church over the past 150 years. Here you will find a special commemoration of that rich history, including historical highlights. St. Patrick Parish is the oldest Roman Catholic Church in Southern Chester County. In 1869, the Diocese of Wilmington, Delaware was created out of the territory that had formerly been part of the Archdiocese of Philadelphia. Until that year, a priest had come from Delaware to say Mass at the Catholic Mission in Kennett Square. It was decided that southern Chester County, then a very rural and remote part of the Archdiocese, should have its own parish. 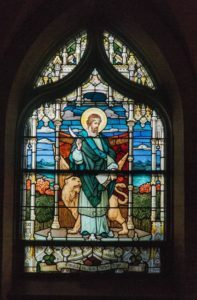 On Christmas Day in 1869, the parish of St. Patrick was created in Kennett Square. It encompassed all of southern Chester County south of West Chester. Construction of a church began immediately, and within a short time a small wooden church was blessed. This Church building located on West South Street measured sixty feet in length and thirty-five feet in width. Archbishop Wood, the fifth bishop of Philadelphia, dedicated the Church in 1872. For almost forty years this church was the setting for the celebration of Sunday Masses, baptisms, weddings, and funerals of the Catholic community. In 1906, ground was broken on Meredith Street for a larger (current) Church and one year later, a cornerstone was laid for the new Church and the new St. Patrick’s was dedicated. Its building is of granite with limestone trim, featuring a bell-tower at the corner, having a seating capacity of 400 and beautiful stained-glass windows from F.X. Zettle of Munich, Germany. In 1918 a parish school began in 1927, the cornerstone was laid for the school building where the Sisters of St. Joseph taught for many years. For much of the time, southern Chester County remained mostly rural. It was only in the past 30 years that the influx of new residents and businesses has taken place. In the 1990’s, the pace of change accelerated and it continues to this day. Such change has brought blessings as well as challenges. In 2012, St. Patrick School closed due to low enrollment and fiscal challenges. Today, our parish is the home to more than 1400 registered Roman Catholic households comprising nearly 4,000 individuals. 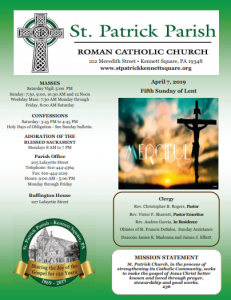 We continue to respond to the times and to find new ways of proclaiming Jesus Christ and His Good News with the same zeal that has characterized St. Patrick’s Parish for the last 150 years.